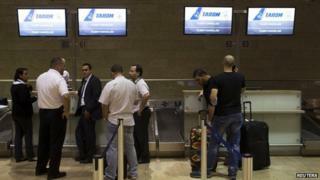 The suspension of US and European airline flights to Israel's Ben Gurion airport after a nearby rocket attack has been extended for a second day. The US Federal Aviation Administration (FAA) renewed its ban on three US carriers - Delta, United and US Airways - for a further 24 hours. Meanwhile, three French and German airlines cancelled more flights to Tel Aviv amid ongoing safety concerns. Air France said it was suspending such flights "until further notice". The FAA first imposed the ban on Tuesday, extending it further on Wednesday citing the "potentially hazardous situation" in Israel and Gaza. German carriers Lufthansa and Air Berlin also extended their flight cancellations until Thursday. Lufthansa said its decision to cancel flights also applied to its subsidiaries including Germanwings, Austrian Airlines, Swiss and Brussels Airlines. British Airways, however, has said it will continue scheduled flights into the region with no current plans to suspend service. The cancellations have drawn criticism in US and Israel. On Wednesday, Republican Texas Senator Ted Cruz said President Barack Obama had orchestrated the FAA flight suspension in order to undermine Israel. "The facts suggest that President Obama has just used a federal regulatory agency to launch an economic boycott on Israel, in order to try to force our ally to comply with his foreign-policy demands," he wrote in a statement. State department spokeswoman Marie Harf said the suggestion was "ridiculous and offensive". "The FAA takes its responsibilities very seriously," she said. "I will speak for them in that case. They make these decision based solely on the security and safety of American citizens, period." Former New York Mayor Michael Bloomberg flew on Israeli airline El Al to Tel Aviv on Tuesday night to "show solidarity with the Israeli people and to demonstrate that it is safe to fly in and out of Israel". On Tuesday, Israel's transportation ministry said: "Ben Gurion Airport is safe and completely guarded and there is no reason whatsoever that American companies would stop their flights and hand terror a prize." The same day, the European Aviation Safety Agency (EASA) said it "strongly recommends" that airlines should avoid operating to and from Tel Aviv. Earlier, Delta said a flight from New York City to Tel Aviv was diverted to Paris on Tuesday after Israeli police confirmed that a rocket landed approximately one mile (1.6km) from Ben Gurion airport. Mike Boyd, an aviation expert and founder of the Boyd group, said that while the FAA had suspended flights before, those have mostly been to more "obscure" places. He said the last time the regulator had suspended flights to Israel was in 1973, although others had indicated flights were suspended during the 1991 Gulf war. Have you been affected by the disruption to flights? You can tell us your experiences by emailing haveyoursay@bbc.co.uk using the subject line "Israel flights".